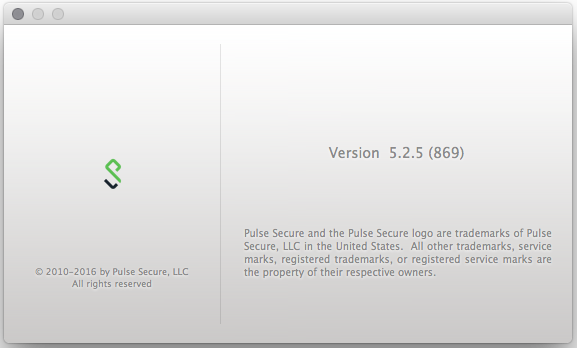 If you're running the 5.2 version of the Pulse Secure VPN client and happen to have upgraded to macOS Sierra, you will quickly find that it has lost your settings and is not able to make any connections. Instead it displays the message "Failed to connect to the Pulse Secure Service". Great! So according to the knowledge articles that version simply needs to be upgraded to the latest 5.2R5 or rather 5.2.5 version. However, there is no link in sight. Luckily for us, the University of Exeter has an 'Off campus access with VPN' page that provides a number of VPN clients for you to download. Now you will be able to connect as before. Another approach is to use an old Junos Pulse 5.0.3 client. I tried that out and it works like a charm, but asks you to upgrade every time you connect to a VPN.